2015 BMW 7 Series revealed | What Car? 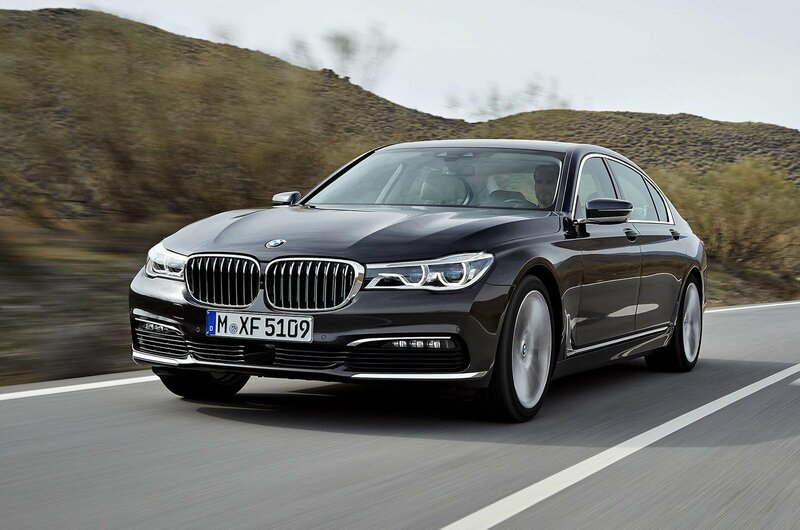 The all-new BMW 7 Series flagship model will go on sale on 24th October, with class-leading CO2 emissions in the luxury saloon class. This sixth-generation 7 Series will take the challenge to the Mercedes-Benz S-Class saloon by coming packed with advanced technology, including efficient new engine options, a next-generation version of BMW’s iDrive infotainment controller, and autonomous driving functions that include the ability for the car to park itself. The 7 Series will again be offered in short- and long-wheelbase versions. It is marginally longer and taller than before, but no wider, and the two wheelbase options are the same length as on the current car. Despite its slightly larger size, the 7 Series is up to 130kg lighter than the model it replaces due to lightweight materials such as carbonfibre being used in its construction. The new chassis includes all-round air suspension that works with a new adaptive damping system for what BMW promises will be improved ride quality, and less body roll, while cornering. Four-wheel steering is an option. The UK will be offered one petrol and one diesel engine to start off with. The sole diesel option, and the UK’s likely best-seller, the 730d, comes with a 261bhp/457lb ft 3.0-litre six-cylinder engine that has CO2 emissions of just 119g/km and combined economy of 62.8mpg. This means the 730d has had a CO2 reduction of 29g/km as well as a 12.4mpg improvement in economy over the current model. Its 119g/km CO2 figure not only beats the 148g/km of the most efficient diesel S-Class, the S350d, but also the 120g/km of the diesel-electric hybrid S300 Bluetec Hybird model. It will be offered in short- and long-wheelbase form, the former available with rear- or all-wheel drive, and the latter available with rear-wheel drive only. The petrol option from launch is a 321bhp 3.0-litre six-cylinder 740i model with 154g/km CO2 emissions. This is offered in long-wheelbase form and rear-wheel drive only. Set to join the range in the UK in due course will be two additional models, a plug-in hybrid and a V8 petrol. The plug-in hybrid version, the 740e, uses the same powertrain as the X5 xDrive 40e, which mates a turbocharged 2.0-litre petrol engine to an electric motor and lithium-ion battery pack. The 740e is a strong all-round performer, with a 321bhp power output and a 5.6sec 0-62mph time, yet it still returns a claimed 134.5mpg and has CO2 emissions of just 49g/km. It can travel on electric power alone for up to 25 miles. The range-topping petrol version will be the 750i xDrive model, which uses a 444bhp 4.4-litre V8 engine. BMW isn’t doing trim levels as such on the new 7 Series, rather standard versions with optional equipment and the further option of making it a sporty M Sport version. So as standard on the lengthy list is 18in alloys, four-zone air-con, a 10in infotainment screen, Comfort seats, LED lights, a high-spec nav system, wood interior trim, heated seats, a reversing camera, parking sensors, an advanced stereo, and sports steering wheel among other items. Long-wheelbase versions get a sunroof as standard, while M Sport trim adds19in alloys, bespoke sporty trim and styling inside and out, and a sportier automatic transmission. The options list is lengthy, and packed with everything from luxury trims to the latest technology. It includes an interior heating package that heats the armrests as well as the seats and steering wheel, night vision, inductive mobile phone charging, and the new parking system, where the car can be parked without the need for the driver to be behind the wheel. There are evolutionary looks outside and in, so the real news inside comes from a new iDrive system that includes a new touchpad on top of the rotary controller that mimics smartphone controls such as swiping and pinching. Another feature of the new iDrive system is gesture control, where simple commands are delivered with a wave of the hand. BMW has upped the price of the 7 Series for the new generation. Whereas the current 730d starts at £58,275, the new 730d starts at £64,350.The 630d M Sport costs from £68,180, the 730d xDrive from £67,260, and the 730d xDrive M Sport from £70,910. As a long-wheelbase model, the 730d costs from £68,480 and from £72,260 in M Sport trim. The two petrol models – 740Li and 740Li M Sport – cost from £72,060 and £75,710 respectively. Strong. The Mercedes-Benz S-Class is a five-star car with almost any of the engine and trim options, while most Audi A8s are four-star cars. More wildcard rivals include the two-star Lexus LS and the more driver-orientated Jaguar XJ, a four-star car. The 7 Series will be looking to improve on its current three-star rating. Bide your time after launch and discounts are sure to be had on the 7 Series. Our Target Price research indicates discounts of around £10,000 are currently available on the present 7 Series at the bottom-end of the range, and almost £20,000 is offered on range-toppers. However, the generosity of these discounts is in large measure due to the current model being at the end of its lifecycle.